This post contains affiliate links. 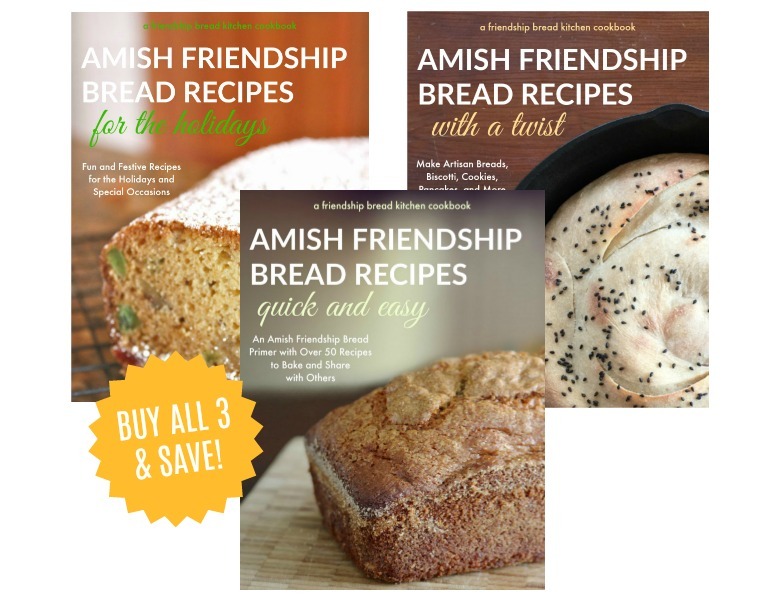 If you click through and make a purchase, the Friendship Bread Kitchen may earn a small commission at no additional cost to you. Thank you for your support! 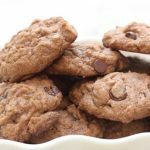 If you’re looking for a way to use up a bag of starter AND have a huge cookie yield, this Amish Friendship Bread Dump Cookie recipe is for you! 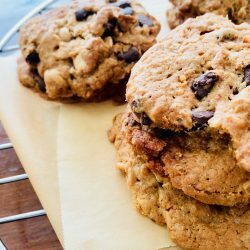 Also known as kitchen sink cookies (because you can put in everything BUT the kitchen sink, LOL), dump cookies are easy, tasty and made to be shared with others. 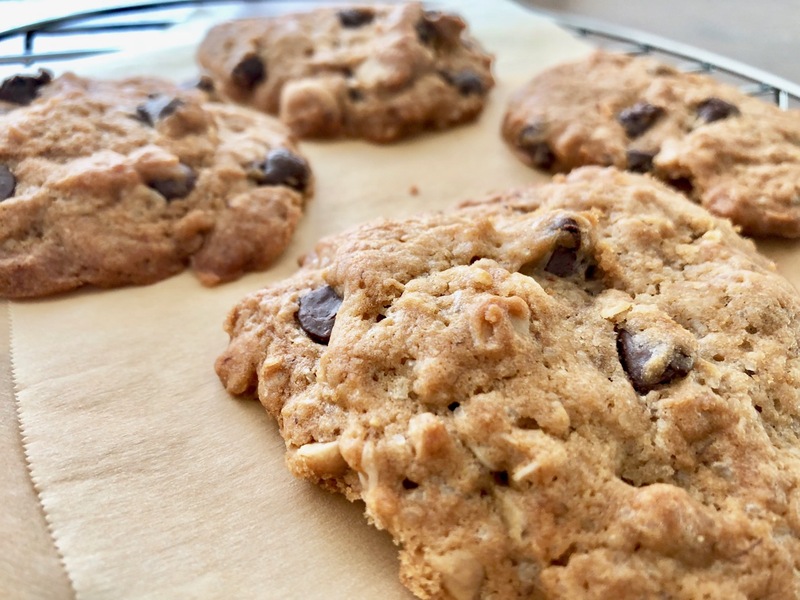 Use our basic cookie recipe and add in whatever you have in the pantry: rolled oats, chocolate chips, nuts, dried fruit, flaked coconut, leftover Halloween candy. They keep well and are great on-the-go treats. 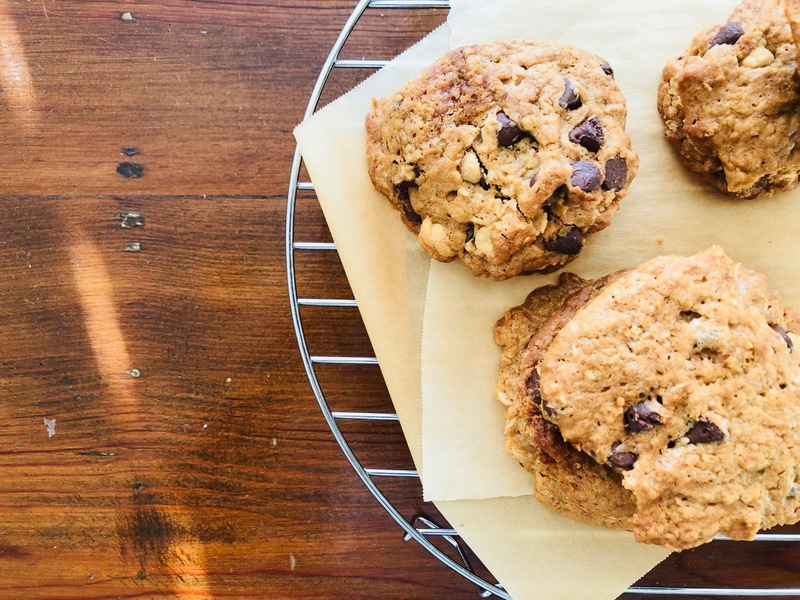 Think: bake sales, teacher appreciation, kid snacks, Super Bowl munchies, holiday cookie swaps. Better yet, make the dough in advance and store it in the fridge or freezer so you can make a batch whenever the craving strikes. 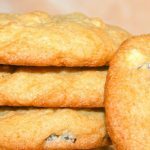 This recipe for Amish Friendship Bread Dump cookies is perfect for a party full of people or a group of close friends. Preheat oven to 350° F (176° C). Combine flour, baking soda, salt, and oats in a large bowl. In a separate bowl, cream starter, butter, shortening, and sugars. Add eggs one at a time, then mashed banana and vanilla. Mix well. Create a well in the dry ingredients and add wet ingredients, stirring until incorporated. 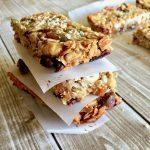 Fold in whatever mix-ins you'd like: chocolate chips, shredded coconuts, nuts, etc. Drop rounded tablespoons onto an ungreased baking sheet (or use parchment paper for easy clean-up). Bake 12 to 14 minutes, or until cookies begin to brown on the edges. Make this in advance: store dough (well-wrapped) in the fridge up to two days before baking. If you'd like to reserve some for the future, wrap well and freeze. I can’t wait to try this recipe! Sounds easy enough for the kids to make and they sound delicious too. These sound yummy! I think I’ll whip up a batch for our neighbors. We have an elderly couple next door, and we have new neighbors across the street. This sounds wonderful! Because I now mostly cook for Hubz and me, I have trouble with recipes that are too big, including Friendship starter. It is great to have other ideas besides basic bread. Can you use any of the various starters for all the recipes? All the recipes on the website are meant for use with the traditional starter. That being said, I know some people swap starters but I can’t say for sure how it will turn out. The alternative starters have recipes that go with them. If you do try something different, let us know how it goes so we can share your results with others! Thank you for your answer. I seen a few starter recipes on the website so thought they all could be used for any of the recipes on the site. What can be used in place of the banana? I’m not big on that flavor, especially in a cookie. I made this recipe. It makes a lot, my mixer could barely handled it. I followed the recipe until it was time to add the chocolate chips. The dough was not thick enough. It was more like a thick batter. I added another cup of oats and two more cups of flour and put it in the refrigerator overnight. I baked some of the cookies and I think I added too much flour. The cookies are OK but not great.